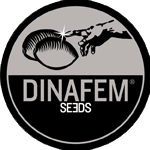 Dinafem\'s extensive range of carefully bred feminized marijuana seeds are of the highest quality, and are favored as the seeds of first choice by many enthusiasts. Dinafem\'s cannabis seeds are assured as being always fresh. The seeds that arrive at your house have been kept in controlled and optimal environmental conditions, taking care to maintain ideal humidity and temperature, thus preventing problems and increasing the germination rates.